One of the most confusing elements of learning English can be knowing what prepositions to use in what circumstances. As you progress, some of them will become second-nature to you but to help speed things up, why not take a look at our handy guide to learn about some prepositions of time. If you’re a teacher, why not save the image and print it our for your students or use it as a poster in your classroom. As mentioned in the graphic, a preposition is a word which connects two parts of a sentence. In the example below we have said: we keep our eggs in the fridge. Here the preposition “in” connects the sentence together. 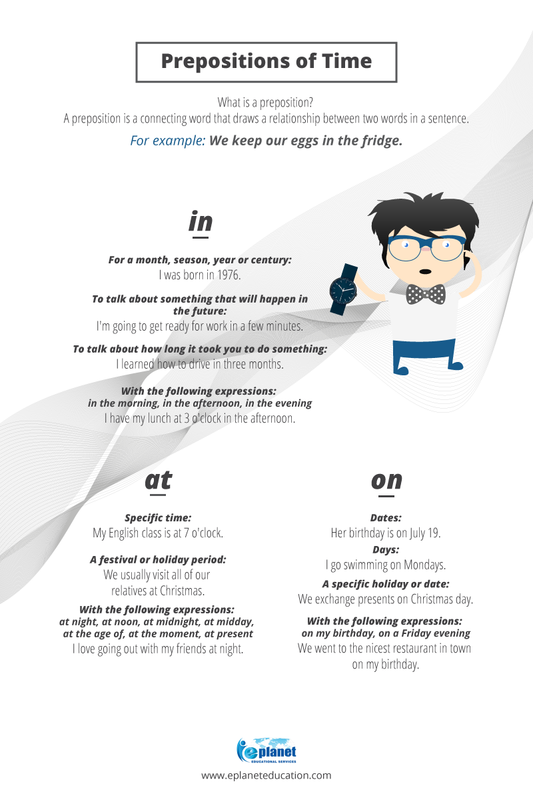 Without the preposition the sentence would look like this: we keep our eggs…the fridge. So we have two parts of a sentence but it doesn’t make sense as there is nothing connecting the eggs and the fridge together. With prepositions of time, the preposition connects something to a certain time. For example: my birthday is on 22nd June. Here the preposition connects my birthday with the actual date of my birthday. We hope you have fun learning or teaching with this handy guide to prepositions of time.